Are you looking for the “One of a Kind” puzzle? Well, you have just found it!! Feel the Addictive Fun! 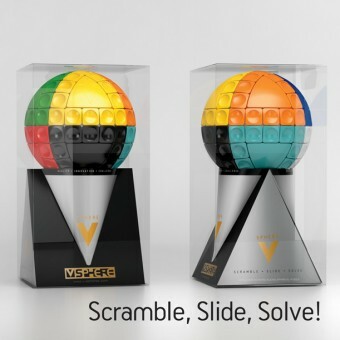 Playing with the V-Sphere™, the 3D sliding spherical puzzle, will make everyone realize that is very addictive and you will not let of it until is solved! It is simply is a “trip of joy” you must experience. Looks and feels great! The superb spherical design consists of eight fixed colored triangles. Seven of them are surrounded by twelve colored moveable rectangular pieces while the latter triangle is surrounded by eleven pieces, leaving always an empty space. This space helps the user to match the rectangular pieces to the fixed triangles of the same color, while sliding the movable parts around the sphere. The sphere’s permanent vibrant colors, light weightconstruction, sturdy feeling and sliding smoothness will impress you. The V-Sphere™ is a worldwide patent, invented, designed and made in EU-Greece. 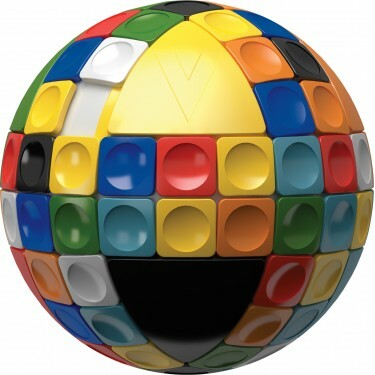 The V-Sphere™ is an eye-catching, innovative spherical sliding puzzle that will challenge, excite an..